Midnyte Reader: I Want To Be A Cowboy (Guest post from Wag the Fox). I Want To Be A Cowboy (Guest post from Wag the Fox). 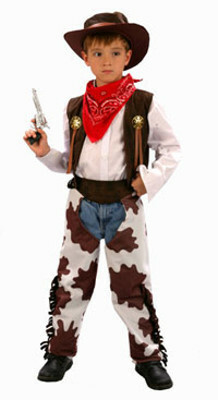 When I was a little kid I always wanted to be a cowboy on Halloween. I had the boots, the vest, the hat, and even a gun. 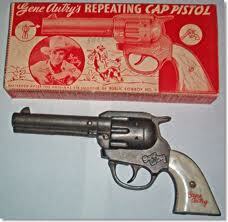 The gun looked a helluva lot like a real six-shooter, but it was just a cap gun. My dad was adamant that I couldn't have any caps, but that didn't bother me because just holding what looked like a real gun was cool enough for me. It was the crown jewel every year for my Halloween costume. I must have gotten some looks too from folks in those early years, seeing a pint-sized kid walking around with what looked like a grown man's gun. Dressing up as a cowboy for Halloween had a second appeal to me, too. It was probably the only costume suggested to me by my parents that didn't require wearing a mask. For reasons that elude me still, I had a genuine fear of covering my face with masks or hoods, especially with those cheap Halloween masks they sold at department stores. The kind of masks that had those tiny holes, about the size of pencil erasers, for your eyes and nostrils or mouth. I can still remember an almost claustrophobic reaction to putting one of those things on when I was four or five. After that, I wanted nothing to do with costumes that covered my face. Becoming a cowboy for Halloween actually came about from having a tantrum when my mother tried to dress me up as a ghost when I was probably five or six years old. Halloween night at my grandparents place, we were getting ready to go trick-or-treating. We were in town for the first time, rather than back home in the countryside, so there were a lot more houses to hit up for candy. But I didn't have a costume, so my mom cut a couple of eyeholes in a bed sheet to make me into a ghost. I would have none of it. I apparently put up enough of a fuss that my first cowboy costume was assembled thanks to donations from relatives and friends of the family. I was a pretty timid and well-behaved kid, but I must have been a real brat that night to get my family to scrounge a cowboy costume together for me. At any rate, it resonated with me, because I loved dressing up as a cowboy enough to do it every Halloween night until I was twelve. When I hit my tween years I outgrew everything in my closet that looked remotely cowboy-ish. I didn't even have the cap gun anymore. It had fallen apart after so many years and lay forgotten at the bottom of my toy box. After a half-decade habit, I had to become something else for Halloween. I still hated masks and I wasn't too keen on face paint either--probably stemming from my loathing of clowns--so my options were limited. I ended up sticking with the firearm motif and became a "candy hunter." I dressed in hunter's orange and got a couple belts used for holding shotgun shells, stuffed the loops with whatever candy would fit in them, and wore them crisscross over my chest. As for the gun, I settled on a homemade wooden rifle. I liked the costume, but it sure fell short of the mythical allure of being a cowboy. I didn't dress up for Halloween very often after that. I was almost a teenager and thought the whole thing was childish. But every time I thought about dressing up, I knew exactly what I wanted to be. I wanted to be a cowboy. A big thanks to Gef for participating in Halloween Hootenanny. Please check out Gef's blog Wag The Fox, it's an ambitious site that delivers the scare!